As Zimbabwe's military held its President, Robert Mugabe, under house arrest, and tensions ran high in a nation that had only ever known one leader, a figure from the country's recent past touched down in the capital Harare. 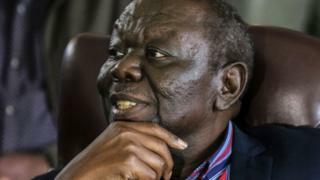 Former Prime Minister Morgan Tsvangirai - who stood against President Mugabe in 2013 but lost in a landslide, an election Mr Tsvangirai alleges was rigged - flew in from South Africa, reportedly to take part in negotiations over the country's future. Mr Mugabe has been detained by the military at his home, in a move that has all the hallmarks of a coup. Mr Tsvangirai has called for the president to stand down, a call that has so far gone unheeded. In the mid 2000s, Mr Tsvangirai was the symbol of resistance to Mr Mugabe's ageing, repressive regime. A former mineworker and trade union chief, he founded the Movement for Democratic Change (MDC) in 2000 and challenged for the presidency in 2008. He gained the most votes, but, according to official results, not enough to win outright. Before the second round was held in June, Mr Mugabe's security forces carried out a campaign of violence against opposition supporters, and Mr Tsvangirai withdrew. Mr Mugabe was declared the winner, but international outrage over allegations of violence and vote-rigging led to a power sharing agreement in which Mr Tsvangirai would serve as prime minister. After months of tortuous negotiations, while the economy collapsed, he was sworn in in February 2009. A charismatic public speaker, Mr Tsvangirai is also a brave man who routinely ran the risk of arrest or assassination to challenge Mr Mugabe's regime. As the leader of the opposition, he was brutally assaulted, charged with treason, and labelled a traitor. He has reportedly survived three assassination attempts, including one in 1997 in which he was nearly forced out of the window of his 10th-storey office. In 2007 he was arrested and beaten by police for taking part in a prayer meeting which they said was illegal. One person was said to have been killed in the raid, and shocking pictures emerged of a bloodied Mr Tsvangirai. Mr Mugabe said at the time that he "deserved" the beating for disobeying police orders. In 2013, Mr Tsvangirai challenged Mr Mugabe for the presidency and lost in a landslide, despite being widely regarded as the favourite. International observers, including the US and UK authorities, expressed concerns about the legitimacy of the incumbent's 61% share of the vote. Critics of Mr Tsvangirai said he should have been able, as prime minister, to prevent electoral fraud. His image was also tarnished by a complicated personal life following the death of his first wife, Susan, in a car crash soon after he became prime minister, in which he was injured. Two women went to court to try to block his marriage to Elizabeth Macheka, 35, in September 2012. The court agreed that he had already wed one of them in a traditional ceremony, so he was obliged to marry Ms Macheka in a "customary" union which recognises polygamy. Bizarrely, all three of the women had close family links to members of Mr Mugabe's Zanu-PF party, lending credence to suggestions that he was the victim of dirty tricks. The eldest of nine children, Mr Tsvangirai left school while a teenager to help support his parents. He has also had a large family - fathering six children with Ms Macheka. He left school early to seek work and in 1974 took work at a mine. Mr Mugabe would later take to calling Mr Tsvangirai "ignoramus" because of his humble background and lack of education. After working as plant foreman at the Bindura Nickel Mine for 10 years, he rose through the union ranks and in 1988 he was elected secretary-general of the Zimbabwe Congress of Trade Unions (ZCTU). As the nation's economy declined and workers' living standards plummeted in the 1990s, the ZCTU took an increasingly political role. When Mr Mugabe tried to raise income tax to pay pensions for veterans of the 1970s war of independence, a ZCTU-organised nationwide strike forced him to back down. In apparent revenge for his part in defeating Mr Mugabe and the war veterans, a group of men burst into Mr Tsvangirai's office, hit him on the head with a metal bar and attempted to throw him out of his 10th floor office window. It would come to be a foretaste of the war veterans' campaign of violence ahead of elections in 2000 and 2002, which led to the deaths of more than 100 MDC supporters. Buoyed by its initial victory, the ZCTU held further strikes against the government's economic mismanagement, but Mr Mugabe stood firm and after intense debate, the ZCTU helped establish the MDC in September 1999. Its nationwide structures were crucial in helping the young party campaign for the June 2000 parliamentary elections, in which it won 57 seats - then the best opposition showing in Zimbabwe's history. Mr Mugabe characterised the MDC as a puppet of white farmers and the UK government, despite its foundations in the country's black working class. Many white farmers had financially supported and campaigned for the MDC. The state-controlled media used to regularly remind voters that Mr Tsvangirai did not participate in the guerrilla war against white minority rule. As a former miner and unionist, his heart is social democratic - roughly in the middle of Zimbabwe's deep economic and political divide. He has in the past blamed Zimbabwe's economic woes on the IMF's structural adjustment programme, calling the IMF "devils". But many in his party are industrialists who believe in the power of the free market, while Mr Mugabe and his allies see the world through socialist eyes. Just before the 2002 presidential elections, a mysterious videotape emerged, allegedly showing Mr Tsvangirai discussing how to assassinate Mr Mugabe using a Canadian consultancy firm, Dickens and Madson. The head of the consultancy, Ari Ben-Menashe, used to work as a lobbyist for the Zimbabwe government and, in the tape, he appears to call Mr Tsvangirai "stupid" for even speaking to him, let alone allegedly discussing an assassination plot. Mr Tsvangirai was eventually acquitted of treason, but for 20 months the possibility of a death sentence hung over his head. He was charged with treason for a third time in 2003, after calling for mass protests to oust Mr Mugabe - protests which fizzled out under the force of police truncheons. Despite his image as a freedom fighter, some of Mr Tsvangirai's closest allies have accused him of behaving like a dictator on occasion. He overruled a decision by the MDC leadership to take part in elections for the Senate in 2005 and ordered a boycott. This led to a split in the party and another blow to his chances of toppling Mr Mugabe. He has also been accused of being impulsive, and at the same time too passive during his tenure as prime minister. He once said that his strategy to unseat Mr Mugabe was to wait while the president mismanaged the economy to such an extent that he would be forced out of office. After he lost in 2013, it seemed unlikely the world would ever find out how Mr Tsvangirai would take to being a leader, but that may be about to change.